The 4630 Sprayer provides 121 kW (165 hp) with a five percent power bulge to 127 kW (173 hp) and 6071 kg/m3 (379 lb-ft) of peak torque to get through tough field conditions. In addition to reducing emissions and lowering engine idle noise, these designs work together to decrease fuel consumption and provide a more efficient use of engine power. Its compact size allows it to fit neatly under the hood for great visibility of the rows passing underneath the operator. A 269-L (71-U.S.-gal.) fuel tank makes it possible to spray for up to 16 hours without refueling. 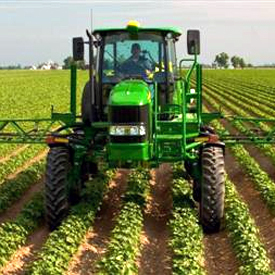 By equipping the 4630 Sprayer with a 269-L (71-gal.) fuel tank, the operator will have plenty of fuel to spray for a full day. The GreenStar-Ready JDLink™ capable cab provides industry-leading visibility, operator comfort, convenience, and productivity. The operator controls the sprayer with the hydro lever that moves with the ComfortCommand™ seat. Exhaust routing, SprayStar™ display placement, and a narrow hood and dash console allow excellent visibility. 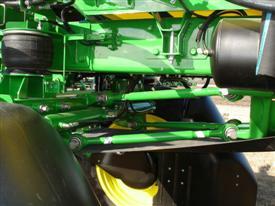 This aids steering in tight row-crop conditions. The GreenStar-ready system provides necessary wiring harnesses. 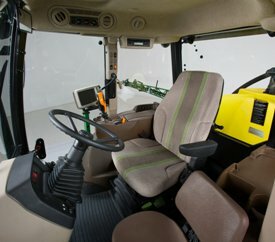 Vehicle-specific components for GreenStar AutoTrac™ (included in the GreenStar AutoTrac-ready cab) and a StarFire™ receiver must be ordered separately to be used in conjunction with the standard GreenStar 3 2630 touch-screen in order to run AutoTrac and John Deere Section Control applications, among others. Operators can keep an eye on booms and spray patterns of all but the center-most nozzles. A front, over-the-axle entrance, easy-to-use side door, and large contour handrails make entry to and exit from the cab easy, convenient. The pressurized cab helps to keep dirt out while air entering the cab's ventilation system passes through an activated carbon filter. 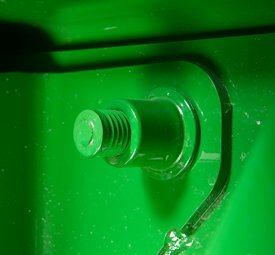 Tuning for sound quality is made possible with an attenuator located under the cab. This attenuator dampens a specific frequency range that an operator would find objectionable over a long day. It is most effective when the engine is running in the higher rpm range. The narrow width axle has a tread width from 1.83 m to 2.24 m (72 in. to 88 in.) and a clearance of 1.12 m (44 in.). The wide axle has a tread width from 2.34 m to 3.07 m (92 in. to 121 in.) and a clearance of 1.27 m (50 in.). Axle range for wide machines varies slightly depending on optionality (hydraulic vs. manual tread adjust). NOTE: In order to achieve 2.29-m (90-in.) tread spacing, 320/80R42 tires must be used with AN401678 rims. Please see your local John Deere Dealer for more information. With these tread spacings, the 4630 Sprayer holds an impressive 50-50 weight split no matter if it is folded or unfolded, full or empty. This weight split helps to reduce compaction through the field and keeps the power to the ground. The wide axle is ideal for the Midwest grain farmer. With the wide axle option, the operator can straddle three rows at 762-mm (30-in. ), 813-mm (32-in. ), 864-mm (34-in. ), 914-mm (36-in. ), 965-mm (38-in. ), or 1016-mm (40-in.) spacing or four rows at 762-mm (30-in.) spacing. The narrow axle is ideal for the cotton or specialty crop farmer. With the narrow axle option, the operator can straddle two rows at 914-mm (36-in. ), 965-mm (38-in. ), or 1016-mm (40-in.) row spacing. The 4630 Sprayer's great ride begins with the frame. 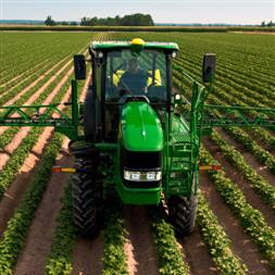 The frame construction allows the 4630 Sprayer to absorb rough field conditions that the operator may encounter. Huck is a U.S.-registered trademark of Alcoa Incorporated. Having the optimal weight distribution means you have a lighter footprint leaving less compaction and less damage to the field, which means you can get into the field earlier. With that in mind, the 4630 Sprayer was built with the optimal weight distribution. BoomTrac Pro increases application accuracy and efficiency by maintaining a more consistent boom height above the crop; drift and skips can be greatly reduced. Operator fatigue is reduced because the operator has fewer operations to perform. The operator is able to feel better at the end of the day and pay more attention to the surrounding environment and field conditions. By reducing the opportunities for the boom to contact the ground, the likelihood of boom damage decreases, which reduces downtime and repair cost. BoomTrac Pro can only be ordered as a three-sensor system. Sensor locations are predetermined and can be either factory installed or installed by the dealer at a later date. The 4630 Self-Propelled Sprayer can be ordered from the factory with BoomTrac Pro installed, or the dealer can install the system at a later date. The addition of either BoomTrac option will add wiring harnesses, hydraulic components, hardware, and sensors to the machine. To allow more flexibility in a broader range of field conditions, a field-installed, adjustable suspension damper bundle (BN400460) is now available. The dampers allow the machine to be customized to accommodate a wide range of field conditions and operator ride preferences. With a six-position adjustment knob that tunes the dampers from firm to soft, the four new mono-tube shock absorbers will be sure to increase overall ride performance as well as provide a wider window of operation based on field conditions. If a customer is driving in a rough field or over strip-till rows, they can soften the ride to allow for increased operator comfort and a smoother ride. Similarly, in a sandy field the operator may turn the adjustment knob to increase the stiffness of the ride. The 4630 Sprayer now comes standard with a GreenStar 3 (GS3) 2630 display. 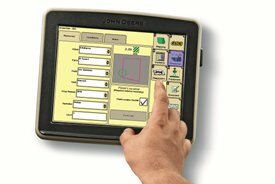 All machine functions are integrated into both of these displays, thereby eliminating the need to use multiple displays in the 4630 Sprayer. The GS3 2630 is a 264-mm (10.4-in.) color touch-screen display. It features state-of-the-art, full-color screens that allow the operator to configure and simultaneously view multiple applications on one home page. The suspension design on the 4630 Sprayer uses a four-bar link system along with an air bag and shock combination to provide a comfortable ride, even in rough conditions. 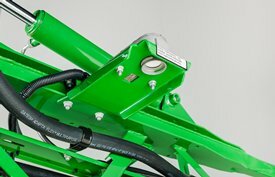 The 4630 Sprayer's suspension provides for 152 mm (6 in.) of travel at the air bag. The air springs are underneath the frame; therefore, visibility of the rows passing underneath is free of suspension components. The auto air-spring leveling system maintains ride height, ensuring 102 mm (4 in.) of travel up and down at all times for 203 mm (8 in.) of total travel. The operator does not have to individually fill each bag or deflate each bag for transport, saving as much as 10 minutes. A switch located near the solution loading system deflates all four bags at one time. Once the machine is running, the on-board air compressor automatically inflates the bags to the optimal set ride height. The 4630 Sprayer's booms are built with high-strength square tube. 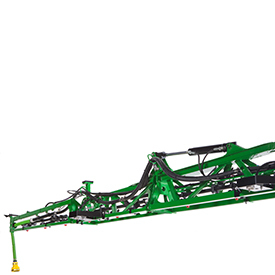 The 4630 boom comes in a 18.29-m/24.38-m (60-ft/80-ft) configuration. Simply fold in the outer wing and go from spraying at 24.38 m to 18.29 m (80 ft to 60 ft.). When the outer wing is folded over top, it is supported by cradles to ensure it will remain in place and secure while spraying in the 18.29-m (60-ft) configuration in rough fields. 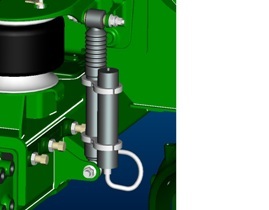 Electrohydraulic steering is required to make AutoTrac function. 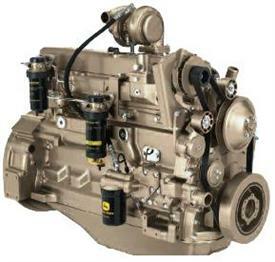 John Deere continues to offer factory installation of the key electrohydraulic components. 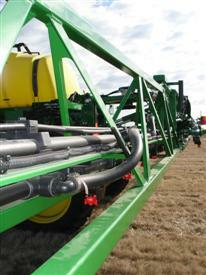 All components are integrated with the rest of the sprayer. Full integration allows for easier setup and use of this highly productive technology. 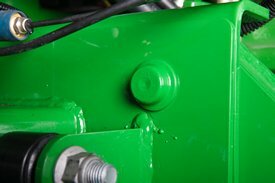 No competitive products offer anything near the level of integration, operator and vehicle interfaces, or serviceability of the John Deere GreenStar AutoTrac assisted steering system. GreenStar AutoTrac for self-propelled sprayers is a guidance system that allows for operation in straight-line, curve-track, or circles (if the optional Pivot Pro module is purchased) to increase productivity. The operator is responsible for turning the vehicle at the end of each pass, as well as steering around obstacles such as trees and waterways. The operator regains control of the steering by simply turning the steering wheel. Service ADVISOR diagnostics greatly assist in reducing service costs and downtime. It allows the John Deere service technician to readily extract vital information about sprayer malfunctions through the Service ADVISOR data port. Diagnostic codes and controller area network (CAN) bus statistics stored by the sprayer and visible in the CommandCenter™ controls are used by service technicians to isolate, identify, and resolve problems. Service ADVISOR Remote extends the machine connectivity of JDLink. With Service ADVISOR Remote, machines can be diagnosed remotely, saving the cost of a field service call. For example, diagnostic trouble codes can be reset and software updates can be uploaded remotely. All 4 Series Sprayers come enabled with JDLink™ communications system with all of the components necessary to use Service ADVISOR Remote, RDA, and WDT included in the base price. With the JDLink Ultimate promotion, a one-year free subscription is included in the base price. WDT makes it easier than ever to manage prescription and field documentation files. Send and receive files with the push of a button. This feature allows operators the ability to share information with trusted advisors, and make data-driven agronomic decisions that boost productivity and profit. To allow more flexibility in a broader range of field conditions, a field-installed, adjustable suspension damper bundle (BN400460) is now available. 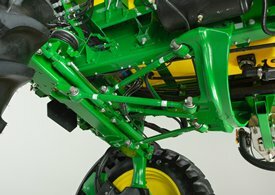 These dampers are adjustable to allow the customer to tune the ride to accommodate varying field conditions and personal ride preferences. These new bundles feature four mono-tube shock absorbers, each with a six-position adjustment knob that adjusts the damper setting from firm to soft.